For related items, see Attack on Titan (disambiguation). "AoT" redirects here. For other uses, see AOT (disambiguation). Attack on Titan (Japanese: 進撃の巨人, Hepburn: Shingeki no Kyojin, lit. "Advancing Giant") is a Japanese manga series both written and illustrated by Hajime Isayama. The series first began in Kodansha's Bessatsu Shōnen Magazine on September 9, 2009, and it has been collected into 28 tankōbon volumes as of April 2019[update]. It is set in a world where humanity lives in cities surrounded by enormous walls that protect the humans from gigantic man-eating humanoids referred to as titans. Cover of Attack on Titan volume 1 featuring Eren Yeager about to attack the oncoming Colossal Titan. Attack on Titan has become a critical and commercial success. As of December 2018[update], the manga has 88 million tankōbon copies in print worldwide (78 million in Japan and 10 million outside of Japan), making it one of the best-selling manga series. The anime adaptation has been well received by critics with the first two seasons being met with universal critical acclaim with praise for its story, animation, music, voice acting and characters, although reception for its third season has been more mixed. However, the anime has proved to be extremely successful in both the U.S. and Japan, thus boosting the series' popularity. Although it also gained fame in neighboring Asian countries, political interpretations of the series caused controversies in China and South Korea. The Titans are giant humanoid figures ranging between 3 and 15 meters (10 and 50 ft) tall and are usually masculine in body structure but lack reproductive organs. Although they do not appear to need food, they instinctively attack and eat humans on sight; it is mentioned that they derive their energy from sunlight. Furthermore, the Titans also do not have a proper digestive tract; once they have eaten their fill of human prey, Titans will vomit large, slimy balls, derisively referred to as "hairballs", as shown in the episode where the squad retakes Trost. Finally, their skin is tough and difficult to penetrate, and they regenerate quickly from injuries, except for a weak spot at the nape of their neck. Combating the Titans is the military, which is divided into three branches. Foremost in the story is the Survey Corps (調査兵団, Chōsa Heidan), which goes out into Titan territory to try to reclaim the land. The Survey Corps is heavily derided in society because of its apparently senseless high casualty rate and little sense of progress. The second and largest branch is the Garrison Regiment (駐屯兵団, Chūton Heidan), which guards the walls and the civilian populace. The third branch is the Military Police Brigade (憲兵団, Kenpeidan), which guards the royal family and lives relatively relaxed lives in the innermost wall, although this eventually results in fraud, corruption, and political subterfuge. The soldiers use a grappling, tethering system called Vertical Maneuvering Equipment (立体機動装置, Rittai Kidō Sōchi) that allows them to jump onto (and swing from) walls, trees, or nearby buildings to attack Titans with dual swords, and use gas canisters which to propel themselves. However, despite it being the soldiers' primary line of both offense and defense against the Titans, it is useless in open and flat terrain like fields. It is later revealed that the Titans were created when Ymir Fritz found the "source of all organic life", and thus became the Founding Titan, which gave her the ability to become a Titan and to create and control the other Titans. When Ymir died as a side effect of having the Titan ability for 13 years, her power was divided among nine who received this same fate, and as such have their abilities passed upon death to other Subjects of Ymir, also known the Eldian people, their home country known as Eldia. These Titans consist of the Founding Titan, the Attack Titan, the Colossal Titan, the Armored Titan, the Female Titan, the Beast Titan, the Jaw Titan, the Cart Titan, and the War Hammer Titan. The Founding Titan remained with the Fritz family as Eldia's 145th King Karl Fritz, corrupted and power-hungry, arranged for his country's fall by the country of Marley and took a handful of his people to the island of Paradis. There, he used countless Colossus Titan bodies to make the walls and erased the memories of most of the people he brought with him with his Titan power, so they did not know anything about the outside world. As the memories of those with Titan powers are passed with them when they are passed to another, his descendants were influenced into continuing his work of ruling the Eldians in the walls through fear from the shadows, while the Eldians in Marley suffer as second-class citizens with some being exiled to Paradis as the Titans that terrorize the island's residents. Eren Jaeger lives with his foster sister Mikasa Ackerman and best friend Armin Arlert in the town of Shiganshina adjacent to Wall Maria, outermost of three circular walls protecting humanity from man-eating Titans said to have killed all other humans one hundred years prior. When Shiganshina and Wall Maria are breached by the Colossal and Armored Titans, invading Titans force humanity to retreat behind Wall Rose. After a titan devours his mother and his father disappears, a vengeful Eren enlists in the military along with Mikasa and Armin. Five years later, the three cadet graduates are positioned in Trost district adjacent to Wall Rose when the Colossal Titan breaches the city gate. During the subsequent Titan invasion, Eren is eaten but survives after creating and controlling a Titan's body. Previously unaware of his abilities, Eren suspects his father's basement holds answers. Although Eren seals Trost's breach using his Titan power, many consider him a potential threat and a military tribunal assigns him to the Survey Corps under Captain Levi's watch, with many of Eren's friends following suit. During an expedition to Shiganshina, a Female Titan unsuccessfully attempts to capture Eren. Despite the expedition's failure, Armin deduces the Female Titan's identity as a fellow cadet from their class named Annie Leonhart with abilities akin to Eren's. Annie encases herself in crystal following her capture in Stohess, collateral damage revealing the walls are formed from massive Titans within them. Following the mysterious appearance of the Beast Titan behind Wall Rose, Eren is kidnapped by his fellow cadets Reiner Braun and Bertolt Hoover, exposed as the Titans who compromised Wall Maria. They and Annie were dispatched by an unknown party to capture the "Coordinate", an ability to control titans which they suspect Eren possesses. Eren manifests this power during an encounter with the titan who killed his mother, allowing him and the pursuing Survey Corps to escape. The Corps theorize that Titans were originally humans, and may regain their human form by consuming an individual with Titan power, acquiring those abilities for themselves. Persecuted by the military police, the Survey Corps discover the royal government seats a figurehead king and suppresses technological advancement. Eren's comrade Historia Reiss learns she is the illegitimate child of the walls' true ruler Rod Reiss, who has her and Eren kidnapped. Rod reveals his ancestor created the walls using the power of the Founding Titan, intending to confine humanity and erasing their memories. The Reiss family passed down the King's power and will until Eren's father Grisha stole the power of the Founding Titan during Wall Maria's fall, and passed its power to Eren by turning him into a Titan via an injection and allowing himself to be devoured. Rod intends for Historia to become a Titan and eat Eren to reclaim the Reiss family's power, but Historia refuses and aids the Survey Corps' rescue of Eren and rebellion against the monarchy. Following Rod's defeat, the military assumes power and crowns Historia queen. Although Eren's lack of royal ancestry inhibits the Founding Titan's power, he obtains an ability to create permanent structures, which the Survey Corps use in their next expedition to seal the breach in Wall Maria. However, the group are ambushed by Reiner, Bertolt and their superior Zeke, the Beast Titan. The Survey Corps subdue Bertolt and drive off the other enemy Titans, but most of the expedition members are killed during the battle with Armin and Commander Erwin Smith left mortally wounded. Levi, armed with a single injection taken from Rod, decides to save Armin over Erwin. Armin devours Bertolt and acquires the Colossal Titan's powers. Before returning home, the survivors recover Grisha's memoirs from the Yeagers' basement. His writings state that human civilization is actually thriving and the people of the walls are members of the Eldian race, whose common ancestor Ymir Fritz acquired the Power of the Titans, granting her progeny the unique potential to become Titans and inherit nine Titan powers. Ymir's descendants dominated world history for centuries until 100 years prior to the series' beginning, when the 145th Eldian King retreated to Paradis Island and established the three walls with the Founding Titan, threatening to retaliate with the titans comprising the walls should his peace be disturbed. The nation of Marley conquered the remaining Eldians, quarantining them in ghettos and passing the seven captured Titan Powers to indoctrinated Eldian "Warriors" for furthering Marley's national interests. Grisha conspired with other Eldian dissidents to acquire the Founding Titan before Marley and free their people but was outed by his son Zeke Yeager, Eren's half-brother and the future Beast Titan, and sentenced to life as a mindless Titan wandering Paradis. However, Grisha was saved by his movement's informant, who entrusted his Titan power and mission to Grisha and sent him to infiltrate the walls and recover the Founding Titan. Eren learns that despite his lack of royal ancestry, he may be able to use the Founding Titan's full "Coordinate" power through physical contact with a titan of royal blood. Four years after the Battle of Shiganshina, a conflict between Marley and a combined offensive sees the emergence of conventional weapons capable of defeating Titans. Fearing the military obsolescence of Eldians will lead to their genocide, the Warriors work with the influential Tybur family, retainers of the War Hammer Titan, to recruit global support for a resumed offensive on Paradis. The family's patriarch, Willy Tybur, holds a rally in the Eldian ghetto of Liberio with foreign dignitaries in attendance and reveals that the 145th King lamented the Eldians' history, arranged the fall of the Eldian Empire and would have allowed for his people's genocide had his will and power not been stolen. Eren, having infiltrated Marley on his own, confronts Reiner before assassinating Willy Tybur as he labels Eren a threat to world peace and declares war on Paradis. With the aid of the Survey Corps in the ensuing battle, Eren steals the War Hammer Titan's power and Zeke defects to Paradis. Eren and the Survey Corps return to Paradis with Zeke via airship, but Eren's friend Sasha is killed by Gabi Braun, Warrior candidate and Reiner's cousin who stowed away along with her friend Falco Grice. Flashbacks depict the preceding four years on Paradis, during which Zeke's followers arrived and introduced Paradis to modern technology and the friendly nation of Hizuru. Through his emissary Yelena, Zeke proposed passing his Titan power to Historia, which would enable Eren to use the Founding Titan's full power to deter foreign invasion until Hizuru modernizes Paradis. Because users of Titan power die thirteen years after their acquisition, the proposition demanded that Historia produce heirs to ensure the availability of the Founding Titan's power. Eren disapproved of this arrangement and instead infiltrated Marley alone and without authorization, coercing the Survey Corps's assistance. In the present, Eren is detained for insubordination and his friends express doubt in his loyalties to them and Paradis over Zeke, citing Eren's role in Sasha's death. It is revealed that Historia is pregnant, preventing the Corps from immediately passing the Beast Titan to her and forcing them to place Zeke under Levi's watch. Suspected of arranging Historia's pregnancy to prolong Zeke's life, Yelena and her followers are arrested. The military's leaders distrust Eren and plan to relinquish his power following the discovery of his secret correspondence with Zeke and Yelena, prompting nationalist rebels loyal to Eren to assassinate the commander-in-chief. Eren escapes his cell and seeks out Zeke alongside his supporters, now called the Yeagerists. Meanwhile, the Warriors infiltrate Paradis in advance of an multinational counterattack against the island. Zeke tries to escape from Levi but is defeated & captured. Levi transports him to somewhere, during which thunder spear blast unexpectedly leaving both of them mortally wounded. But Zeke is saved by a mysterious titan and found by the Yeagerists, Hange escapes with Levi's remains. Pieck holds Eren at gunpoint, but suddenly switches sides and says she will reveal other hideouts — it turns out to be a trap and the Jaw titan attacks Eren, he transforms into a Titan and sees Marleyan airships over him and realizes that Reiner is leading the attack. Hajime Isayama created a 65-page one-shot version of Attack on Titan in 2006. In a 2018 interview with NHK, Isayama revealed that his inspiration for the series came from his hometown of Hita, Ōita, while wondering if there were monsters beyond the walls bordering the town. Originally, he also offered his work to the Weekly Shōnen Jump department at Shueisha, where he was advised to modify his style and story to be more suitable for Jump. He declined and instead decided to take it to the Weekly Shōnen Magazine department at Kodansha. Before serialization began in 2009, he had already thought of ideas for twists, although they are fleshed out as the series progresses. The author initially based the scenery in the manga on that of his hometown, which is surrounded by mountains. While working at an internet cafe, Isayama encountered a customer who grabbed him by the collar. It was this incident that showed him "the fear of meeting a person I can't communicate with," which is the feeling that he conveys through the Titans. When designing the appearances of the Titans, he uses several models such as martial artist Yushin Okami for Eren Yeager's Titan form as well as Brock Lesnar for the Armored Titan. George Wada, the anime's producer, stated that the "Wall of Fear" was influenced by the isolated and enclosed nature of Japanese culture. He also said that the inner feelings of every individual is one of the series' main influences. Isayama later would confirm that Attack on Titan was inspired in part by Muv-Luv Alternative, the second visual novel in the Muv-Luv visual novel series. Isayama estimated his basic monthly timeline as one week to storyboard and three weeks to actually draw the chapter. The story is planned out in advance, even marking down in which collected volumes a specific "truth" will be revealed. In September 2013, he stated that he was aiming to end the series in 20 collected volumes. Originally, Isayama planned to give the series a tragic conclusion similar to that of the film adaptation of Stephen King's The Mist, where every character dies. However, positive response to the manga and anime has caused the author to contemplate changing the ending due to the impact it could have on fans. On November 16, 2018, Isayama reported saying that the final chapter is now in development and did a documentary about it. Hajime Isayama's original manga serial, Attack on Titan commenced publication in Kodansha's monthly publication Bessatsu Shōnen Magazine starting with the September 2009 issue. The first tankōbon collected volume was released on March 17, 2010. The most recent, volume 22, was released on April 7, 2017. In November 2014, the manga had 45 million copies in print. By September 2016, the number had increased to 60 million. 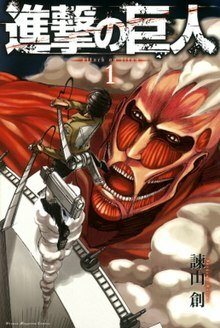 The series' twelfth collected volume was given a first printing of 2.2 million copies, making Attack on Titan one of only two manga series ever to get an initial print surpassing 2 million, the other being One Piece. Volume 13 has the highest initial first print of the series so far, with 2,750,000 copies. It is also the first print run record for its publisher, Kodansha. A comedic spin-off of the series, titled Attack on Titan: Junior High (進撃！巨人中学校, Shingeki! Kyojin Chūgakkō) and written by Saki Nakagawa, began serialization in Bessatsu Shōnen Magazine's May 2012 issue. It follows the main characters as they battle the Titans while in junior high school. Another manga series based on the prequel light novels Attack on Titan: Before the Fall started running in Kodansha's Monthly Shōnen Sirius from August 2013, drawn by Satoshi Shiki. An additional spin-off based on the No Regrets visual novel was serialized in the shōjo manga magazine Aria, titled Attack on Titan: No Regrets (進撃の巨人 悔いなき選択, Shingeki no Kyojin: Kuinaki Sentaku). It is written by Gun Snark and illustrated by Hikaru Suruga. It focuses on the origins of Captain Levi, one of the most prominent characters in the main series. A yonkoma spin-off, called Spoof on Titan (寸劇の巨人, Sungeki no Kyojin, "Titan Short Skits") and drawn by hounori, was released on Kodansha's Manga Box smartphone and tablet application from December 2013 to December 30, 2014 in both Japanese and English. A manga adaptation of Hiroshi Seko's Attack on Titan: Lost Girls novel, written and illustrated by Ryōsuke Fuji, began publication in Bessatsu Shōnen Magazine on August 9, 2015. In North America, the series is published in English by Kodansha USA. They published the first volume on June 19, 2012,. The fifteenth was released on April 7, 2015. By July 2015, the manga had 2.5 million copies in circulation in North America. The first three spin-off manga have also been licensed by Kodansha USA, who published the first volume of each between March and June 2014. It announced its license to Spoof on Titan at the New York Comic Con in October 2015, and its acquisition of Lost Girls in March 2016. A light novel series titled Attack on Titan: Before the Fall (進撃の巨人 Before the fall), written by Ryō Suzukaze and illustrated by Thores Shibamoto, began on April 1, 2011. Its story is set before the events of the manga and it was published by Kodansha in three volumes. While the first tells the story of Angel, the blacksmith who develops the first prototypes of the Vertical Maneuvering Equipment, and the following two follow a young man who was found as a baby in the stomach of a Titan. A second light novel series called Attack on Titan: Harsh Mistress of the City (進撃の巨人　隔絶都市の女王, Shingeki no Kyojin Kakuzetsu Toshi no Joō), written by Ryō Kawakami and illustrated by Range Murata, was published between August 1, 2014 and May 1, 2015. Vertical released the novels in North America in 2014 and 2015. A novel titled Attack on Titan: Lost Girls (進撃の巨人 Lost Girls), written by Hiroshi Seko, was published on December 9, 2014. It comprises three short stories featuring Mikasa and Annie Leonhart, titled "Lost in the cruel world", "Wall Sina, Goodbye", and "Lost Girls". It was also released in English by Vertical, in 2016. Garrison Girl: An Attack on Titan Novel, a novel created by American writer Rachel Aaron was published by Quirk Books on August 7, 2018. It is centered on Rosalie Dumarque, who defies her family to join military garrison. An anime television series adaptation produced by Wit Studio (a subsidiary of IG Port) aired on MBS between April 7, 2013 and September 29, 2013, directed by Tetsurō Araki with Yūki Kaji starring as Eren, Yui Ishikawa voicing Mikasa and Marina Inoue as Armin. Both Funimation and Crunchyroll simulcast the series on their respective websites, and Funimation began releasing the series on North American home video in 2014. The first season was acquired for distribution in the UK by Manga Entertainment, with season 2 handled by Sony Pictures UK. Madman Entertainment acquired the show for distribution in Australia and New Zealand, and streamed the series on Madman Screening Room and AnimeLab. The final episode was also aired in Japanese theaters. The anime had some production issues with needing more animators with Wit Studios' character designer, Kyoji Asano tweeting and looking for active animators to work on the anime. An OVA version of the "Ilse's Notebook" special chapter from tankōbon volume 5 was originally scheduled to be released on August 9, 2013, bundled with the volume 11 limited edition, but was postponed and included with a limited edition of volume 12, released on December 9, 2013, instead. The OVA was bundled on subtitled DVD with the English limited edition release of the 17th manga volume, released on December 1, 2015. A second OVA was released on April 9, 2014, bundled with the 13th volume of the series, this one focused on the members of the 104th Training Corps. Two additional OVA episodes, based on the Attack on Titan: No Regrets prequel manga, were bundled with the 15th and 16th volumes of the main series, released on December 9, 2014 and April 9, 2015, respectively. The anime previously aired on Adult Swim's Toonami block. In Australia, the anime aired on SBS 2 on Tuesdays, in Japanese with English subtitles, with the first episode having aired on September 30. The anime was compiled into two animated theatrical films with new voice acting from the same cast. The first film Attack on Titan – Part 1: Crimson Bow and Arrow (「進撃の巨人」前編～紅蓮の弓矢～, Shingeki no Kyojin Zenpen ~Guren no Yumiya~) covers the first 13 episodes and was released on November 22, 2014, while the second film Attack on Titan – Part 2: Wings of Freedom (「進撃の巨人」後編～自由の翼～, Shingeki no Kyojin Kōhen ~Jiyū no Tsubasa~) adapts the remaining episodes and adds new opening and ending footage. It was released on June 27, 2015. A rebroadcast of the first season was aired from January 9, 2016 on NHK's BS Premium channel. The compilation films were also broadcast in January 2017 on MBS. A second season of the anime series was announced on the opening day of the first theatrical film, which was originally set to be released in 2016. It was then confirmed in the January 2017 issue of the Bessatsu Shōnen Magazine that the second season would premiere in April 2017. Masashi Koizuka directed the second season, with Araki acting as chief director. It has also been licensed by Funimation. It ran for 12 episodes. An anime television adaptation of the Attack on Titan: Junior High manga spin-off began airing in October 2015. The series was directed by Yoshihide Ibata at Production I.G, with series composition by Midori Gotou, character design by Yuuko Yahiro, and music by Asami Tachibana. Linked Horizon performed the opening theme "Youth Like Fireworks". The ending theme, "Ground's Counterattack" ("Hangeki no Daichi"), is performed by the voice actors for Eren, Mikasa, and Jean. A rebroadcast of the series was aired during January 2016. The second season of the anime series premiered between April 1, 2017 and June 17, 2017. The season premiere was simulcast on Funimation, Crunchyroll, and the former's VRV channel at 10:30 AM EST. That same day, it was also announced that the second season of Attack on Titan would premiere on Toonami on April 29. It was subsequently announced on April 3 that the second season would premiere one week earlier, on April 22 instead. Following the broadcast of the second season's last episode, a third season was announced. It premiered on NHK General TV in July 2018; however, it will not be broadcast on MBS and other UHF channels. A three part OVA of Attack on Titan: Lost Girls was released in 2017 and 2018 with the limited editions of volumes 24, 25, and 26. A third compilation film was announced alongside the release date of the anime series' third season at the "Shingeki no Kyojin" Reading & Live Event Orchestra "Attack Oto Taikan 2" event, titled Attack on Titan: The Roar of Awakening (「進撃の巨人」 ～覚醒の咆哮～, Shingeki no Kyojin ~Kakusei no Hōkō~). The film recapped the events of the anime series' second season and was released on January 13, 2018. A trailer for the third season was released on April 27, 2018. Funimation announced that they would air the worldwide premiere of the first episode at Anime Expo on July 8, 2018. They also announced that the first episode would air in theaters in the US and Canada alongside Attack on Titan: Roar of Awakening on July 10, 2018. The series' third season premiered in Japan on July 23, 2018, with its first part running to October 15, 2018. Part 2 of the series' third season will premiere on April 28, 2019. There have been four video game adaptations of Attack on Titan developed by Nitroplus staffers in collaboration with Production I.G. Nitroplus clarified that the studio as a company is not involved in the Attack on Titan Blu-ray Disc games, while individual staffers are. The games are visual novels and were included in the first copies of the third and sixth Blu-ray Disc volumes of the anime. The games cover spin-off stories about the characters of Attack on Titan. Isayama supervised the development of the games. The third Blu-ray volume was released on September 18 with Seko's Lost in the Cruel World visual novel about Mikasa, and a preview of Gun Snark's No Regrets (悔いなき選択, Kuinaki Sentaku, lit. "A Choice with No Regrets"). The sixth Blu-ray volume was released on December 18 with the full version of No Regrets about Levi and Erwin's past, Jin Haganeya's visual novel In the Forest of the Night, Burning Bright about Eren and Levi, and Seko's Wall Sina, Goodbye visual novel about Annie. An action game, titled Attack on Titan: Humanity in Chains (進撃の巨人 ～反撃の翼～, Shingeki no Kyojin ~Hangeki no Tsubasa~, subtitle lit. "Wings of Counterattack"), was developed by Spike Chunsoft for the Nintendo 3DS and released in Japan on December 5, 2013, North America on May 12, 2015 and Europe on July 2, 2015. A smartphone social game, titled Attack on Titan: Howl Toward Freedom (Shingeki no Kyojin ~Jiyū e no Hōkō~) is in development by Mobage for iOS and Android platforms. In the game, players play as a character who has been exiled from Wall Rose. Players must build and fortify a town outside the wall and expand it by manufacturing items as well as using Titans and exploiting resources from other players. A set of Attack on Titan costumes was added to Dead or Alive 5 Last Round in July 2016, alongside a playable arena based on Wall Rose during an attack by the Colossal Titan. Additionally, Attack on Titan gameplay and merchandise has been featured in a crossover event with Nexon MMORPG MapleStory in its Japanese and GMS versions. Another game, Attack on Titan, for PlayStation 4, PlayStation 3, and PlayStation Vita, published by Koei Tecmo and developed by Omega Force, was announced at Gamescom 2015. It was released on February 18, 2016 in Japan. Later was confirmed to be released worldwide along with PC and Xbox One versions. Capcom were developing an Attack on Titan arcade game named Shingeki no Kyojin: Team Battle, but the development was frozen by 2018. Attack on Titan: Escape from Certain Death was announced to be in development for the Nintendo 3DS in Famitsu magazine in October 2016. The game was initially supposed to be launched on March 30, 2017 but was later postponed to May 11, 2017. Attack on Titan 2: Future Coordinates was released on November 30, 2017 in Japan. A sequel game to Koei Tecmo's Attack on Titan, Attack on Titan 2, was announced in August 2017 and released in March 2018. An expansion for Attack on Titan 2, Attack on Titan 2: Final Battle is scheduled to be released in Japan on July 4, 2019, and in North America and Europe on July 5, and will be available on PlayStation 4, Nintendo Switch, Xbox One (with Xbox One X support), and on PC through Steam. A live-action film was announced to be in production in October 2011. In December 2012, it was reported that Tetsuya Nakashima left his position as director. According to film distributor Toho, Nakashima had considerable creative differences on the scriptwriting and other matters. In December 2013, Shinji Higuchi was revealed to be directing, and would also be responsible with the special effects. Writer Yūsuke Watanabe and critic/subculture expert Tomohiro Machiyama were announced to be scripting the movie with series creator Isayama. In July 2014, it was revealed that two films will be released in the summer of 2015. It was also revealed that some major characters would be cut from the line up, most noticeably Levi Ackerman and Erwin Smith. A teaser trailer for the first live-action film was released in March 2015. The following month, Toho released the second trailer for the first film, and announced the second installment would be called Attack on Titan: End of the World. In June 2015, a third trailer for the first film was released, revealing the Three-Dimensional Maneuvering Gear, as well as confirming the film would be released in IMAX theaters in Japan. A live-action miniseries, titled Shingeki no Kyojin: Hangeki no Noroshi (進撃の巨人 反撃の狼煙, "Attack on Titan: Counter Rockets") and utilizing the same actors as the films, started streaming on NTT DoCoMo's online-video service dTV on August 15, 2015. The three episode series focuses on Zoë Hange and her research of the Titans, as well as how the Vertical Maneuvering Equipment was created. Deadline Hollywood reported on January 17, 2017 that Warner Bros. is in negotiations to secure the film rights to the Attack on Titan franchise. Fantastic Beasts and Where to Find Them producer David Heyman would be on board to produce a proposed two-film project that would remake the 2015 Japanese live-action film adaptations. A day later, however, Kodansha representatives said there were no negotiations with Warner Bros. However, on October 29, 2018, it was revealed that Warner Bros. and Kodansha finalized a deal to produce a live action adaptation with It director Andy Muschietti signing on to direct the film. A Stage Play titled LIVE IMPACT was announced on the wraparound jacket band on Volume 21. It was scheduled to run from July 28 to September 3, 2017. The Stage Play was cancelled after one of the staff members being involved in an accident. Two guidebooks to the manga titled Inside and Outside were released on April 9 and September 9, 2013, featuring concept art, character profiles and interviews. They were combined into one and released in North America on September 16, 2014, by Kodansha USA. A 16-minute drama CD was created with the anime's staff and included in the January 2014 issue of Bessatsu Shōnen Magazine. On November 3, 2014, American writer C. B. Cebulski revealed that a crossover between Attack on Titan and Marvel Comics was in the works. Cebulski scripts the scenario written by the original author Hajime Isayama. The one-shot crossover featured Spider-Man, the Avengers and the Guardians of the Galaxy facing off against several Titans, including the Colossal Titan, the Armored Titan, and the Female Titan on the streets of New York City. During Free Comic Book Day 2015, Marvel's Secret Wars preview included an 8-page presentation "Attack on Avengers" by creator Hajime Isayama with art by Gerardo Sandoval. It was announced at the 2015 New York Comic-Con that an American comic book titled Attack on Titan Anthology will be published. From January 23 to May 10, 2015, Universal Studios Japan hosted attractions based on Attack on Titan. "The Real" Attack on Titan Experience features a life-size 15 meter tall Eren titan engaging a 14 meter tall female titan in combat. Other attractions include a ground level titan, which visitors can pose with. From May 31 to August 25, 2019, Universal Studios Japan is again set to host attractions for Attack on Titan as part of the "Cool Japan" program, including "immersive effects on a grand scale" according to editor Shintaro Kawakubo. Attack on Titan won the Kodansha Manga Award in the shōnen category in 2011, was nominated for the 4th Manga Taishō Award and both the 16th and 18th annual Tezuka Osamu Cultural Prize. The 2012 edition of Kono Manga ga Sugoi!, which surveys people in the manga and publishing industry, named Attack on Titan the eighth best manga series for male readers, while the 2014 edition named it the sixth best. Attack on Titan was the top favorite manga for Yomiuri Shimbun's Sugoi Japan Awards in 2015. Attack on Titan was the second highest selling manga series of 2013, with 15,933,801 copies sold in a single year. In April 2014, Oricon reported that 30 million volumes of the series have been sold. In the first half of 2014 it topped the chart, ending One Piece's five-year reign as the highest selling series in that period, with Isayama surprised about it and thanking the readers. By the end of the year, it was the second best selling manga with 11,728,368 copies sold. In 2015, the series sold 8,778,048 copies ranking third for the year, and 6,544,081 in 2016 for the fourth rank. Attack on Titan was the second best-selling manga of 2017 with sales of 6,622,781 copies, behind only One Piece. The manga's publisher, Kodansha, credits Attack on Titan for the company's first revenue increase in eighteen years. The anime is noted to have helped in boosting the series' sales while Mainichi Shimbun called it a "once-in-a-decade hit." Six of the seven English volumes published in North America at the time charted on The New York Times Manga Best Seller list for the week of October 13, 2013, and volume one was on the list for 81 weeks straight. In June 2015, the first volume clocked in at its 100th week on the top 10 chart, having sold 2.5 million copies. It also currently holds the title of appearing on the list for a volume with 121 weeks. Volume one was also number one on Nielsen BookScan's list of top 20 graphic novels in American bookstores for October 2013, and for the month of September, the series had more volumes on the list than any other series. The Young Adult Library Services Association in the United States named the series one of its "Great Graphic Novels for Teens" in 2013. Kodansha USA's English release won the 2014 Harvey Award for Best American Edition of Foreign Material. Attack on Titan was the only manga to be nominated for the 2015 Goodreads Choice Award for Best Graphic Novel/Comic. Many have analyzed Attack on Titan as representing "the hopelessness felt by young people in today's society." while writer Mao Yamawaki called it a "coming-of-age story of the boys and girls at its core," with a new mystery every episode. It is these mysteries that critic Tomofusa Kure says amplifies readers' expectations. The artwork of the manga has been criticized as crude by some reviewers, with Isayama himself admitting his drawings are "amateurish." However, those same critics stated that after years of serialization, the art has been improving, and Kure believes that had the illustrations been "refined", it would not have conveyed the "eeriness" that is a key characteristic of the work. In a short review, Jason Thompson noted how the characters conveniently receive "power-ups" to create plot twists, but concluded that these said plot twists and the manga's post-apocalyptic world are "too good to miss." The series has gained a strong popularity in not only Japan but also throughout the world. For instance, coverage of the anime appeared on the front page of the Hong Kong free newspaper am730 on May 27, 2013, concerning its popularity within Hong Kong as well as in Mainland China and Taiwan. The series also attracted criticism: the South Korean Electronic Times magazine accused Attack on Titan of having a militaristic message that serves Japanese Prime Minister Shinzō Abe's political leanings; while the series also resonated with Hong Kong youths who saw the invading Titans as a metaphor for mainland China. Hong Kong media commentator Wong Yeung-tat praised Isayama's style and the versatility of Attack on Titan's setting, which opens itself to readers' various interpretations. In 2013, after media linked to a 2010 blog post by Isayama indicating that the design of the character Dot Pixis was based on the Imperial Japanese General Akiyama Yoshifuru, an Internet flame war about the general's war record (e.g. allowing the Port Arthur massacre to occur) ensued on his blog and included death threats to the author. Because many of the threats written in Japanese had grammatical errors, it is believed that they were written by people outside of Japan. On June 12, 2015, the Chinese Ministry of Culture forbade distribution of Attack on Titan along with 38 other anime and manga titles. ^ Although Funimation holds the master license to the series in Australasia, the British Isles, and North America, Funimation only directly handles distribution in North America. Madman Entertainment distributes the series in Australasia, and Manga Entertainment (season 1) and Sony Pictures UK (season 2) distributes the series in the British Isles. ^ "Attack On Titan". Funimation. Retrieved July 29, 2018. ^ a b c Ohara, Atsuhi; Yamane, Yukiko (August 17, 2013). "Boosted by anime version, 'Attack on Titan' manga sales top 22 million". Asahi Shimbun. Archived from the original on August 22, 2013. Retrieved November 1, 2013. ^ Thompson, Jason (November 14, 2013). "House of 1000 Manga: Crunchyroll Manga". Anime News Network. Archived from the original on March 30, 2014. Retrieved May 15, 2014. ^ Kodansha USA Publishing (July 6, 2013). "Attack on Titan Now Monthly" (Press release). Archived from the original on September 5, 2014. Retrieved September 4, 2014. ^ "Funimation Acquires Attack on Titan Season 3". Anime News Network. April 26, 2018. Retrieved December 1, 2018. As part of its agreement with Kodansha, Funimation has secured the international rights to home entertainment, video on demand and broadcast distribution of the series in the U.S., Canada, U.K., Ireland, Australia and New Zealand. ^ Hodgkins, Crystalyn (January 1, 2019). "Roundup of Newly Revealed Print Counts for Manga, Light Novel Series – December 2018". Anime News Network. Retrieved January 1, 2019. ^ Hodgkins, Crystalyn (November 3, 2018). "Roundup of Newly Revealed Print Counts for Manga, Light Novel Series – October 2018". Anime News Network. Retrieved November 3, 2018. ^ "1st Attack on Titan Blu-ray/DVD to Bundle Manga 'Prototype'". Anime News Network. May 7, 2013. Archived from the original on November 10, 2013. Retrieved November 2, 2013. ^ "Hajime Isayama Shares His Inspiration for Attack on Titan". Anime News Network. ^ Isayama, Hajime. "Transformation!!!!". Archived from the original on September 18, 2014. Retrieved August 30, 2014. ^ "Attack on Titan Creator Named Tourism Ambassador of Hometown". Anime News Network. November 4, 2014. Archived from the original on November 8, 2014. Retrieved November 5, 2014. ^ "'Attack on Titan' author expresses fears through popular boys' manga". Asahi Shimbun. July 20, 2013. Archived from the original on November 2, 2013. Retrieved November 1, 2013. An incident that occurred soon after his move to Tokyo served as inspiration for the manga. Isayama was working a night job at an Internet cafe, when a customer suddenly grabbed him by the collar. "I felt the fear of meeting a person I can't communicate with." He projects that terror and discomfort through the titans. ^ a b "Interview with Attack on Titan Creator Hajime Isayama". MTV. Archived from the original on July 30, 2013. Retrieved July 25, 2013. ^ Isayama, Hajime (April 17, 2013). "アクセス数がすごい！" [The number of views is amazing!] (in Japanese). Blog.livedoor.jp. Archived from the original on May 18, 2013. Retrieved May 19, 2013. ^ a b "Interview: George Wada, Producer of Attack on Titan". Anime News Network. July 23, 2013. Archived from the original on July 25, 2013. Retrieved July 25, 2013. ^ Saitō, Tamaki (November 15, 2014). "諫山創 落書きと過去作品。". Brutus (in Japanese). Magazine World. 790. Archived from the original on March 24, 2016. Retrieved October 10, 2015. ^ "Attack on Titan Creator Aims to End Manga in 20 Volumes". Anime News Network. September 25, 2013. Archived from the original on November 3, 2013. Retrieved October 29, 2013. ^ 「進撃の巨人」の漫画家、諫山創インタビュー！ トラウマという財産!? 人生観と漫画創作が濃密に交わる諫山創の視点とは？ (in Japanese). White Screen. December 4, 2013. Archived from the original on December 7, 2013. Retrieved December 7, 2013. ^ "Attack on Titan Creator Considers Changing Ending". Anime News Network. December 7, 2013. Archived from the original on February 12, 2014. Retrieved March 11, 2014. ^ 進撃の巨人（２２） (in Japanese). Kodansha. Archived from the original on March 30, 2017. Retrieved March 30, 2017. ^ Hennum, Shea (July 30, 2015). "What Our Failure to Cover Attack on Titan Says About the Comics Industry". Archived from the original on August 16, 2016. Retrieved June 29, 2016. ^ "Attack on Titan Manga Has 60 Million Copies in Print". Anime News Network. September 2, 2016. Archived from the original on September 2, 2016. Retrieved September 2, 2016. ^ "Attack on Titan Prints 28 Million as Latest Book Gets 2.2-Million Printing". Anime News Network. December 6, 2013. Archived from the original on December 10, 2013. Retrieved December 7, 2013. ^ "Crunchyroll". Crunchyroll. Archived from the original on September 23, 2015. ^ "Attack on Titan Manga Inspires Comedy Spinoff Manga". Anime News Network. April 13, 2012. Archived from the original on November 4, 2013. Retrieved October 29, 2013. ^ "Daphne in the Brilliant Blue's Shiki Penning Attack on Titan Spinoff Manga". Anime News Network. August 21, 2013. Archived from the original on August 20, 2013. Retrieved August 21, 2013. ^ "Attack on Titan Spinoff Manga to Run in Aria Shōjo Magazine". Anime News Network. August 22, 2013. Archived from the original on August 29, 2013. Retrieved August 28, 2013. ^ "Kodansha Launches Free App With Attack on Titan, Knight in the Area Manga Spinoffs". Anime News Network. December 3, 2013. Archived from the original on August 31, 2014. Retrieved July 31, 2014. ^ "Spoof on Titan 4-Panel Manga Ends". Anime News Network. December 30, 2014. Archived from the original on December 31, 2014. Retrieved December 30, 2014. ^ "Attack on Titan: Lost Girls Novel Gets Manga Adaptation". Anime News Network. July 8, 2015. Archived from the original on August 12, 2015. Retrieved August 17, 2015. ^ "Attack on Titan 1". Random House. Archived from the original on May 2, 2013. Retrieved April 6, 2013. ^ "Attack on Titan 15". Random House. Archived from the original on November 29, 2014. Retrieved November 15, 2014. ^ "Attack on Titan Manga Has 2.5 Million Copies in Print in English". Anime News Network. July 27, 2015. Archived from the original on July 28, 2015. Retrieved July 27, 2015. ^ "Kodansha USA Adds Attack on Titan: Junior High Manga, Guidebooks". Anime News Network. October 11, 2013. Archived from the original on October 11, 2013. Retrieved October 11, 2013. ^ "Kodansha Comics Adds Attack on Titan: Before the Fall, No Regrets Spinoff Manga". Anime News Network. October 11, 2013. Archived from the original on October 13, 2013. Retrieved October 11, 2013. ^ "Kodansha Comics Adds Spoof on Titan, I Am Space Dandy Manga". Anime News Network. October 10, 2015. Archived from the original on October 11, 2015. Retrieved October 10, 2015. ^ Green, Scott (March 22, 2016). "Kodansha Comics Announces Seven Manga Licenses". Crunchyroll. Archived from the original on May 9, 2016. Retrieved May 7, 2016. ^ "New York Comic Con 2013: Vertical Panel". Anime News Network. October 11, 2013. Archived from the original on November 10, 2013. Retrieved October 29, 2013. ^ "Vertical Adds Attack on Titan: Before the Fall Light Novel Series". Anime News Network. October 11, 2013. Archived from the original on October 11, 2013. Retrieved October 11, 2013. ^ "Vertical Licenses More Attack on Titan Light Novels". Anime News Network. October 11, 2014. Archived from the original on October 13, 2014. Retrieved October 12, 2014. ^ "Attack on Titan Gets 'Lost Girls' Novel Spinoff". Anime News Network. November 17, 2014. Archived from the original on July 17, 2015. Retrieved July 31, 2015. ^ "Vertical Adds Attack on Titan: Lost Girls Novel, Nichijō, FukuFuku: Kitten Tales Manga". Anime News Network. July 3, 2015. Archived from the original on August 6, 2015. Retrieved July 31, 2015. ^ "Vertical Adds Attack on Titan: Lost Girls Novel, Nichijō, FukuFuku: Kitten Tales Manga". Anime News Network. July 3, 2015. Archived from the original on August 16, 2016. Retrieved June 29, 2016. ^ 「進撃の巨人」製作委員会. "放送情報" [Broadcast Information] (in Japanese). Archived from the original on March 30, 2013. Retrieved January 14, 2016. "ＭＢＳ 4月6日より 毎週土曜25時58分～ ※4月13日は26時10分～" See rest of article for other broadcasting times. ^ "コミックナタリー – アニメ「進撃の巨人」に神谷浩史、小野大輔、朴ロ美出演". Natalie.mu. April 3, 2013. Archived from the original on June 6, 2013. Retrieved May 11, 2013. ^ "放送情報 | TVアニメ「進撃の巨人」公式サイト". Archived from the original on May 8, 2013. Retrieved May 11, 2013. ^ "Yuuki Kaji, Yui Ishikawa, Marina Inoue Lead Attack on Titan Cast". Anime News Network. December 5, 2012. Archived from the original on December 8, 2012. Retrieved December 6, 2012. ^ "Saki Fujita, Keiji Fujiwara Join Attack on Titan TV Anime's Cast". Anime News Network. March 8, 2013. Archived from the original on March 11, 2013. Retrieved March 9, 2013. ^ "Funimation Plans Attack on Titan on Home Video in 2014". Anime News Network. May 19, 2013. Archived from the original on June 7, 2013. Retrieved May 20, 2013. ^ "Crunchyroll to Stream "Attack on Titan" Anime". Crunchyroll. April 13, 2013. Archived from the original on April 15, 2013. Retrieved April 13, 2013. ^ "Manga Entertainment UK Acquires 'Attack On Titan' Anime License". The Fandom Post. May 25, 2013. Retrieved June 29, 2016. ^ "Madman Acquires Attack On Titan". Anime News Network. April 30, 2013. Archived from the original on December 1, 2015. Retrieved November 30, 2015. ^ McCallum, Jessica (March 3, 2017). "Attack on Titan Season 2 Streaming on AnimeLab April 2017!". AnimeLab. Retrieved April 3, 2019. ^ "アニメ『進撃の巨人』最終話先行上映イベントを全国の映画館で". ORICON STYLE. Archived from the original on September 24, 2015. ^ ""Attack on Titan" Anime Studio Needs More Animators". Crunchyroll. Archived from the original on August 17, 2015. ^ "Attack on Titan Original Anime DVD Delayed 4 Months". Anime News Network. June 2, 2013. Archived from the original on June 7, 2013. Retrieved June 2, 2013. ^ "Kodansha USA to Bundle Original Anime DVD Episode With Attack on Titan Manga". Anime News Network. July 11, 2015. Archived from the original on August 1, 2015. Retrieved August 3, 2015. ^ "Attack on Titan Manga's 2nd Anime DVD Bundle Listed". Anime News Network. November 20, 2013. Archived from the original on November 23, 2013. Retrieved November 21, 2013. ^ "Attack on Titan: No Regrets Spinoff Gets Anime DVDs". Anime News Network. August 5, 2014. Archived from the original on August 6, 2014. Retrieved August 5, 2014. ^ "Attack on Titan to Run on Adult Swim's Toonami Block". Anime News Network. Archived from the original on April 14, 2014. Retrieved April 13, 2014. ^ Sam (September 30, 2014). "Attack on Titan Airing on SBS 2…. Right Now!". The Otaku's Study. Archived from the original on July 22, 2015. Retrieved December 1, 2014. ^ "2nd Attack on Titan Compilation Film Adds New Ending Footage Linked to 2nd TV Season". Archived from the original on August 8, 2015. ^ "Attack on Titan Anime Gets 2 Compilation Films in 2014–2015". Anime News Network. April 3, 2014. Archived from the original on April 5, 2014. Retrieved April 3, 2014. ^ "1st Attack on Titan Compilation Film Slated for November 22". Anime News Network. June 6, 2014. Archived from the original on June 11, 2014. Retrieved June 15, 2014. ^ "NHK's BS Premium to Air "Attack on Titan" TV Anime from January 2016". Crunchyroll. December 11, 2015. Archived from the original on March 17, 2016. Retrieved April 17, 2016. ^ MBSにて劇場版「進撃の巨人」前後編の地上波放送が決定！. shingeki.tv (in Japanese). Archived from the original on December 10, 2016. Retrieved December 11, 2016. ^ "Attack on Titan TV Anime Gets 2nd Season in 2016". Anime News Network. November 22, 2014. Archived from the original on November 25, 2014. Retrieved November 22, 2014. ^ yonkouproductions (December 7, 2016). "Attack On Titan Season 2 To Air April 2017". yonkouproductions. Archived from the original on December 9, 2016. Retrieved December 8, 2016. ^ "Attack on Titan Anime's 2nd Season Premieres in Spring 2017". Anime News Network. July 3, 2016. Archived from the original on July 4, 2016. Retrieved July 3, 2016. ^ "Funimation Licenses Attack on Titan Anime's 2nd Season". Anime News Network. December 9, 2016. Archived from the original on December 10, 2016. Retrieved December 9, 2016. ^ "Attack on Titan Season 2 Listed With 12 Episodes". Anime News Network. March 30, 2017. Archived from the original on March 31, 2017. Retrieved March 30, 2017. ^ "Attack on Titan: Junior High Spinoff Manga Gets TV Anime Adaptation". Anime News Network. July 31, 2015. Archived from the original on August 2, 2015. Retrieved August 3, 2015. ^ "Crunchyroll". Crunchyroll. Archived from the original on September 2, 2015. ^ "Attack on Titan: Junior High Anime's Ending Artist, 3rd Promo Video Revealed". Anime News Network. Archived from the original on October 2, 2015. ^ 「進撃！巨人中学校」製作委員会. "TVアニメ「進撃！巨人中学校」TOKYO MXにて、2016年1月より再放送決定!!". 進撃の巨人中学校. Archived from the original on March 29, 2016. Retrieved April 17, 2016. ^ "HOW TO WATCH ATTACK ON TITAN SEASON 2 THIS WEEKEND". IGN. March 31, 2017. Archived from the original on March 31, 2017. Retrieved April 1, 2017. ^ Toonami News [@ToonamiNews] (April 2, 2017). "BREAKING NEWS: #AttackOnTitanS2 is coming to Toonami on April 29. We are working to get the commercial now and will bring it to you soon" (Tweet) – via Twitter. ^ "Attack On Titan Season 2 is coming to Toonami April 22nd at 12:30am!". Facebook. April 3, 2017. Archived from the original on September 10, 2017. Retrieved April 15, 2017. ^ "Attack on Titan Anime Season 3 to Air in 2018". Anime News Network. June 16, 2017. Archived from the original on September 10, 2017. ^ Green, Scott (July 2, 2017). ""Attack On Titan" Anime Season 3 Listed For Spring". Crunchyroll. Archived from the original on September 5, 2017. Retrieved July 2, 2017. ^ "Attack on Titan Season 3 Premieres in July After January Compilation Film". Anime News Network. October 29, 2017. Retrieved October 29, 2017. ^ "Attack on Titan Season 3 Premieres in July After January Compilation Film". Anime News Network. October 29, 2017. Retrieved November 20, 2017. ^ "Season 3 - Official Subtitled Trailer IT'S OFFICIALLY COMING TO FUNIMATION, JULY 2018!". Twitter. April 27, 2018. Retrieved April 27, 2018. ^ Ressler, Karen (June 12, 2018). "Anime Expo to Host World Premiere of Attack on Titan Season 3". Anime News Network. Retrieved June 20, 2018. ^ Ressler, Karen (May 30, 2018). "Attack on Titan Season 3 Gets World Premiere in U.S., Canadian Theaters". Anime News Network. Retrieved June 20, 2018. ^ Hodgkins, Crystalyn (April 27, 2018). "=Attack on Titan 3rd Season's Promo Video Reveals July 22 Premiere (Updated)". Anime News Network. Retrieved June 20, 2018. ^ Loo, Egan (October 14, 2018). "Attack on Titan TV Anime Returns Next April". Anime News Network. Retrieved December 25, 2018. ^ "TV Anime "Shingeki no Kyojin" Season 3 Part.2 no Hōsō Nichiji ga Kettei!" TVアニメ「進撃の巨人」Season 3 Part.2の放送日時が決定！. shingeki.tv (in Japanese). February 16, 2019. Retrieved February 16, 2019. ^ "Attack On Titan Games Coming From Steins;Gate Developer Nitroplus". Siliconera. May 19, 2013. Archived from the original on June 7, 2013. Retrieved May 25, 2013. ^ "Nitro+: Not Involved in Blu-ray Visual Novels, But Our Staffers Are". Anime News Network. May 21, 2013. Archived from the original on June 7, 2013. Retrieved May 25, 2013. ^ a b "Attack on Titan Blu-rays Add Visual Novels by Nitro+ Staff". Anime News Network. May 18, 2013. Archived from the original on June 7, 2013. Retrieved May 25, 2013. ^ "Magazine: Attack on Titan Has Video Game Planned – Interest". Anime News Network. July 2, 2013. Archived from the original on July 7, 2013. Retrieved July 6, 2013. ^ "Attack on Titan Video Game Slated for 2014 – News". Anime News Network. Archived from the original on July 12, 2013. Retrieved July 12, 2013. ^ "Attack on Titan Gets 3DS Game from Spike Chunsoft in 2013". Anime News Network. August 6, 2013. Archived from the original on August 25, 2013. Retrieved August 28, 2013. ^ "Attack on Titan Social Game's Promo Streamed". Anime News Network. January 22, 2014. Archived from the original on January 23, 2014. Retrieved January 22, 2014. ^ "Dead or Alive 5: Last Round Brings The Fight To Attack on Titan". Siliconera. July 20, 2016. Archived from the original on December 29, 2016. Retrieved December 28, 2016. ^ "Attack On Titan Comes To...MapleStory". Kotaku. Archived from the original on June 28, 2016. Retrieved June 29, 2016. ^ Wesley Copeland (August 5, 2015). "Gamescom 2015: Koei Tecmo Announces Attack on Titan Tie-in". IGN. ^ "Koei to Publish New Attack on Titan Game". Dread Central. Archived from the original on November 26, 2015. ^ "Attack on Titan Video Game's 2nd Promo Video Reveals February Release". Archived from the original on November 27, 2015. ^ "Attack on Titan – Announcement Trailer". YouTube. KOEI TECMO AMERICA. Archived from the original on April 7, 2016. Retrieved April 7, 2016. ^ "Capcom to debut 'Attack on Titan' arcade game – Robot 6 – The Comics Culture Blog". Robot 6 – The Comics Culture Blog. Archived from the original on April 3, 2016. Retrieved April 17, 2016. ^ ゲーム『進撃の巨人２』公式 [@kt_shingeki] (February 28, 2017). "【お知らせ】3月30日(木)を予定していた3DS『進撃の巨人 死地からの脱出』の発売日を5月11日(木)変更させていただくこととなりました。 発売を心待ちにしていただいていた皆様には、さらにお待たせすることになり申し訳ありません。" (Tweet) – via Twitter. ^ 進撃の巨人２～未来の座標～公式 [@Shingeki_3DS_SC] (June 2, 2017). "3DS『進撃の巨人２～未来の座標～』発売決定！ ティザーサイトを公開しました。明日からはTVアニメ放送枠内でCMが放送されますのでお楽しみに！" (Tweet) – via Twitter. ^ 進撃の巨人２～未来の座標～公式 [@Shingeki_3DS_SC] (September 7, 2017). "3DS『進撃の巨人２～未来の座標～』の発売日が11月30日に決定！ 全国のゲーム販売店及び販売サイトで予約受付を順次開始します。店舗オリジナル予約特典情報も詳細が決まりましたら公式サイトで紹介致しますのでお楽しみに！" (Tweet) – via Twitter. ^ "Koei Tecmo's Attack on Titan 2 launches March 2018 in North America and Europe". October 24, 2017. ^ "ATTACK ON TITAN 2: FINAL BATTLE Game Adapts New Characters and Battles on PS4, XBOX, Switch, and Steam". Crunchyroll. Retrieved March 18, 2019. ^ "Shingeki no Kyojin/Attack on Titan Manga to Get Film in Fall 2013". Anime News Network. October 12, 2011. Archived from the original on September 17, 2014. Retrieved July 29, 2014. ^ "Director Nakashima Leaves Live-Action Attack on Titan Film". Anime News Network. December 13, 2012. Archived from the original on April 27, 2013. Retrieved April 8, 2013. ^ "実写映画版 『進撃の巨人』 の中島哲也監督が降板". Archived from the original on December 14, 2012. Retrieved December 13, 2012. ^ "Shingeki no Kyojin/Attack on Titan Manga to Get Film in Fall 2013". Anime News Network. October 12, 2011. Archived from the original on October 15, 2011. Retrieved October 15, 2011. ^ "New Live-Action "Attack on Titan" Director Announced". Archived from the original on December 6, 2013. Retrieved December 8, 2013. ^ "SFX Director Shinji Higuchi to Helm Live-Action Attack on Titan Film". Archived from the original on December 6, 2013. Retrieved December 8, 2013. ^ "Live-Action Attack on Titan Confirmed for 2 Films". Anime News Network. July 29, 2014. Archived from the original on August 1, 2014. Retrieved July 29, 2014. ^ "New Trailer & Poster for Live-Action Attack on Titan Movie, Part Two Titled Attack on Titan: End of the World". Final Reel. Archived from the original on May 1, 2015. Retrieved April 17, 2015. ^ "New Trailer for Live-Action Attack on Titan Movie Teases First Look at Three Dimensional Manoeuvre Gear". Final Reel. Archived from the original on June 23, 2015. Retrieved June 23, 2015. ^ "'Attack on Titan' mini-series to stream on dTV from August". Asahi Shimbun. July 13, 2015. Archived from the original on July 21, 2015. Retrieved July 28, 2015. ^ "Deadline: Warner Bros. In Negotiations for Western Attack on Titan Films". Anime News Network. January 17, 2017. Archived from the original on January 18, 2017. Retrieved January 17, 2017. ^ "Kodansha Rep: Report of Warner Bros.' Attack on Titan Films Is 'Incorrect'". Anime News Network. January 18, 2017. Archived from the original on January 19, 2017. Retrieved January 18, 2017. ^ McNary, Dave (October 29, 2018). "Andy Muschietti to Direct 'Attack on Titan' for Warner Bros. (Exclusive)". Variety. Retrieved October 29, 2018. ^ "Attack on Titan Manga Gets Stage Play Next Summer". Anime News Network. December 6, 2016. Archived from the original on February 28, 2017. ^ "Attack on Titan Stage Play Reveals Eren, Mikasa, Armin Actors in Costume". Anime News Network. February 5, 2017. Archived from the original on February 28, 2017. ^ "Attack on Titan Stage Play Acrobat Dies After Accident". Anime News Network. April 11, 2017. Archived from the original on April 14, 2017. ^ "Twitter". Twitter. Archived from the original on April 22, 2017. ^ 進撃の巨人　ＩＮＳＩＤＥ　抗 (in Japanese). Kodansha. Archived from the original on November 12, 2013. Retrieved November 11, 2013. ^ 進撃の巨人　ＯＵＴＳＩＤＥ　攻 (in Japanese). Kodansha. Archived from the original on November 12, 2013. Retrieved November 11, 2013. ^ "Attack on Titan Guidebook: INSIDE & OUTSIDE". Random House. Archived from the original on August 19, 2014. Retrieved August 17, 2014. ^ "Bessatsu Shōnen Mag to Bundle Attack on Titan Drama CD". Anime News Network. November 10, 2013. Archived from the original on November 11, 2013. Retrieved November 11, 2013. ^ Sunu, Steve (November 3, 2014). "Marvel Comics/"Attack on Titan" Crossover in the Works". Comic Book Resources. Archived from the original on September 7, 2015. Retrieved August 3, 2015. ^ Green, Scott (November 5, 2014). "More Information on Marvel Comics vs "Attack on Titan" Crossover Previewed". Crunchyroll. Archived from the original on November 5, 2014. Retrieved August 3, 2015. ^ "Marvel Unleashes FCBD 2015 Titles: Secret Wars #0 and All-New, All-Different Avengers FCBD". Free Comic Book Day. Archived from the original on August 1, 2015. Retrieved August 3, 2015. ^ "NYCC EXCLUSIVE: Kodansha Announces "Attack on Titan" Anthology". Comic Book Resources. Archived from the original on October 9, 2015. ^ Green, Scott. "VIDEO: Universal Studios Japan Opens "Attack on Titan" and "Evangelion" Attractions". Crunchyroll.com. Crunchyroll. Archived from the original on January 23, 2015. Retrieved January 23, 2015. ^ Kara Dennison (February 10, 2019). "Theme Park Attraction Takes You into Upcoming Attack on Titan Events". Crunchyroll. Retrieved February 13, 2019. ^ 講談社漫画賞 (過去の受賞者一覧) [Kodansha Manga Award (list of past winners)] (in Japanese). Kodansha. Archived from the original on August 19, 2013. Retrieved April 10, 2013. ^ "March comes in like a lion, Space Bros. Win Kodansha Manga Awards". Anime News Network. May 12, 2011. Archived from the original on June 9, 2013. Retrieved April 10, 2013. ^ "13 Titles Nominated for 4th Manga Taisho Awards". Anime News Network. January 16, 2011. Archived from the original on January 18, 2011. Retrieved October 30, 2013. ^ "16th Tezuka Osamu Cultural Prize Nominees Announced". Anime News Network. February 10, 2012. Archived from the original on August 25, 2013. Retrieved October 30, 2013. ^ "18th Tezuka Osamu Cultural Prize Nominees Announced". Anime News Network. March 9, 2014. Archived from the original on March 9, 2014. Retrieved March 9, 2014. ^ "Top Manga Ranked by Kono Manga ga Sugoi 2012 Voters". Anime News Network. December 8, 2011. Archived from the original on January 4, 2014. Retrieved October 30, 2013. ^ "Top Manga Ranked by Kono Manga ga Sugoi 2014 Voters". Anime News Network. December 9, 2013. Archived from the original on May 8, 2014. Retrieved December 11, 2013. ^ "Yomiuri Shimbun's 'Sugoi Japan Awards' Winners Announced". Archived from the original on January 15, 2016. ^ "Top-Selling Manga in Japan by Series: 2013". Anime News Network. December 1, 2013. Archived from the original on December 2, 2013. Retrieved December 1, 2013. ^ "Attack on Titan Manga Sells Over 30 Million". Anime News Network. April 23, 2014. Archived from the original on April 25, 2014. Retrieved April 25, 2014. ^ "Attack on Titan Manga Tops One Piece in Half-Year Sales". Anime News Network. Archived from the original on June 22, 2014. Retrieved June 15, 2014. ^ "Crunchyroll". Crunchyroll. Archived from the original on February 19, 2015. ^ "Top-Selling Manga in Japan by Series: 2015". Anime News Network. Archived from the original on April 9, 2016. Retrieved April 17, 2016. ^ "Top-Selling Manga in Japan by Series: 2016". Archived from the original on December 21, 2016. ^ Ashcraft, Brian. "The Best-Selling Manga Of 2017 In Japan". Kotaku. Retrieved February 4, 2018. ^ "Attack on Titan Manga Has 31 Million in Circulation". Anime News Network. March 10, 2014. Archived from the original on July 7, 2014. Retrieved March 11, 2014. ^ "Attack on Titan Manga Prints 8.7 Million More After Anime". Anime News Network. June 3, 2013. Archived from the original on June 8, 2013. Retrieved June 4, 2013. ^ "New York Times Manga Best Seller List, October 13–19". Anime News Network. October 29, 2013. Archived from the original on October 31, 2013. Retrieved October 30, 2013. ^ "New York Times Manga Best Seller List, December 21–27". Anime News Network. January 2, 2015. Archived from the original on January 3, 2015. Retrieved January 2, 2015. ^ ""Attack on Titan" Hits 100th Week on "New York Times" Manga Best Sellers List". Crunchyroll. Archived from the original on September 24, 2015. ^ Green, Scott (July 28, 2015). "English Version of 'Attack on Titan' Tops 2.5 Million Copies in Print". Crunchyroll. Retrieved November 3, 2018. ^ "New York Times Manga Best Seller List, August 14–20". Archived from the original on August 27, 2016. ^ "Attack on Titan Tops Graphic Novels in U.S. Bookstores in October". Anime News Network. November 7, 2013. Archived from the original on November 9, 2013. Retrieved November 7, 2013. ^ "5 Attack on Titan Graphic Novels Land in U.S. Bookstores' Top 20 in September". Anime News Network. October 4, 2013. Archived from the original on November 10, 2013. Retrieved October 30, 2013. ^ "U.S. Librarians Rank Stargazing Dog in Teens' Top 10". Anime News Network. February 1, 2013. Archived from the original on August 25, 2013. Retrieved October 30, 2013. ^ "Attack on Titan Manga Wins 2014 Harvey Award". Anime News Network. September 9, 2014. Archived from the original on September 10, 2014. Retrieved September 9, 2014. ^ "Attack on Titan nominated for a Goodreads Choice..." Kodansha Comics. Archived from the original on November 18, 2015. ^ "House of 1000 Manga – Crunchyroll Manga". Anime News Network. November 14, 2013. Archived from the original on December 22, 2013. Retrieved February 1, 2014. ^ a b "Attack on Titan explosive hit in China, Hong Kong, and Taiwan – 4 million YouTube hits – Netizens debate walls under siege (《進擊の巨人》爆紅中港台 Youtube點擊400萬 網民熱議圍牆抗敵)". am730. Hong Kong. May 27, 2013. p. 1. Archived from the original on June 7, 2013. Retrieved June 27, 2013. ^ "A revival of militarism? Attack on Titan sparks Korean-Japanese spat (軍國主義復活？／進擊的巨人 引發韓日論戰)". The Liberty Times. Taipei. June 12, 2013. Archived from the original on June 25, 2013. Retrieved June 27, 2013. ^ Wong Yeung Tat (February 13, 2011). "Popular Manga: Because we have our own titans to defeat (流行漫畫﹕因為，我們也有想要打倒的巨人)". Ming Pao. Hong Kong. Archived from the original on October 17, 2014. Retrieved June 27, 2013. ^ "A Thousand Death Threats Against a Popular Anime Creator". Kotaku. July 1, 2013. Archived from the original on July 3, 2013. Retrieved July 1, 2013. ^ "China bans 38 anime & manga titles including Attack on Titan". Special Broadcasting Service. June 12, 2015. Retrieved August 31, 2018. Wikimedia Commons has media related to Attack on Titan.